Do you love shopping and saving money at Publix? Right now you can save even more on the products you love with their latest savings event: Running Out? Run In. From May 15th through May 22nd , you can save money on some of your favorite brands from General Mills to Procter & Gamble. 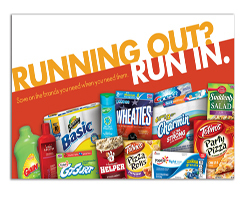 Products include great items like Hamburger Helper, Wheaties, Totino’s, Gain, Charmin, Crest, and more! Giveaway: One Simply Sweet Home reader will win a $25 Publix Gift Card. I’d like to stock up on Yoplait yogurt and Honey Nut Cheerios! I would stock up on Yoplait Light Yogurt with Granola and Honey Nut Cheerios. I would like to stock up on milk and fruit. I love to stock up on Totino’s! I would stock up on anything BOGO with coupons! I would stock up on Honey Nut Cheerios, thanks!